The report was short, since it is provisional, including no details about the ages of the women involved in these births. The full preliminary report, with more details, will not be out for months. Final reports generally come out about a year after the preliminary data. 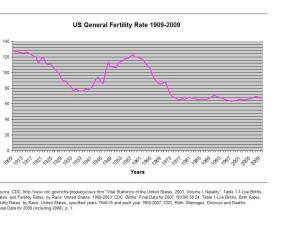 If the full reports confirm the provisional data, the 2010 US fertility rate (64.7 births per thousand women in the 15-44 age band) will have fallen below the recent low of 64.8 hit in 2002 – when we were also in recession. The years 1995-1999, characterized by economic boom, also had fertility rates under 64.7 (64.6, 64.1, 63.6, 64.3, 64.4, respectively). You may recall that last year we had stories telling us that the BIRTH rate had fallen to an all time low – and I wrote a piece all about how the birth rate was not telling us that women were having kids at an all-time low level — it’s the fertility rate that tells us that. Instead the birth rate was going down in part because it tells you how many births there were per people in the whole population, and since people are living longer, and those old folks don’t have babies (or very few), there were fewer births per thousand. The fertility rate was going down too in 2009 however – just not to record lows. And it’s still declining.